The mother of intolerance is the Union home ministry, run by ultra-conservative bureaucrats who are inclined to take a hard line on matters ranging from fighting insurgencies to putting citizens under surveillance to outlawing dissident groups, says Praful Bidwai. Perhaps no other country has as great and complex a maze of laws and rules that give arbitrary or unlimited powers to the State as India. And no other State has abused them as comprehensively as has India to censor free expression, manipulate opinion, curb dissent, criminalise protest, and harshly victimise people -- in order to impose manifestly harmful decisions on them. The maze includes scores of new laws (200, according to one estimate), in addition to the Indian Penal Code, Criminal Procedure Code and Indian Police Act, inherited from the colonial era. One such law is the Foreign Contribution Regulation Act, 2010, which enables the government to control the flow of overseas funds to non-profit non-governmental organisations through an elaborate system of screening and scrutiny containing several exclusions, and with powers to order summary suspension of permits to receive foreign funding. FCRA's origins lie in the Emergency (1975 to 1977), imposed by Indira Gandhi partly out of her paranoid conviction that 'certain foreign powers' were out to destabilise her by instigating domestic political groups. FCRA originally banned funding for political parties, election candidates, trade unions, the media, etc. All applicants for a permit to receive foreign funding would have to be registered for at least three years and would be closely screened by the Intelligence Bureau, no less. It has never been easy to get an FCRA permit. The process usually takes a couple of years, if not longer. Only 39,000 out of India's two million-plus NGOs have such permits. The permits were originally granted for an indefinite period. But in 2010, FCRA was amended and new rules were introduced. These restricted permits to five years and debarred groups from 'political actions'. Now, these are all non-violent and democratic forms of protest, which emerged from India's freedom struggle, and are recognised around the world as legitimate. Banning such activities is self-evidently discriminatory. This rule can be used against almost any organisation which supports rights-based mobilisations of various groups -- women, landless farmers, Adivasis, Dalits, students, religious minorities, people affected by industrial, mining and irrigation projects -- irrespective of political alignment. The government has even used the rule to refuse a permit to the NGO PRS Legislative Research, which analyses the functioning of parliamentary institutions and receives media exposure. It also provides research assistance to MPs who ask for it. Some 250 MPs cutting across party lines use the service, but the government evidently does not trust PRS's integrity and regards the service as potentially subversive. The home ministry last year cancelled the FCRA permits of some 4,000 NGOs citing minor technical grounds such as change of address. Some of these cancellations smack of a witch-hunt. The worst case of such abuse of power under FCRA pertains to the Indian Social Action Forum, a coalition of 700 people's organisations and NGOs active in various anti-communal mobilisations, anti-displacement struggles, and campaigns against destructive 'development' projects like Posco, Koodankulam and Vedanta, besides Special Economic Zones. On April 30, the home ministry summarily suspended INSAF's FCRA permit and froze its bank accounts on the ground that its activities are likely to 'prejudicially affect the public interest', without any explanation of which specific activities would do so. This violates FCRA's stipulation that the reasons for such suspension must be 'recorded in writing'. INSAF's work has expanded the space for those affected by State policies and helped to bring their concerns to national attention and asserted their democratic right to intervene in and influence development policies. INSAF has made important interventions in public debates on issues of national concern, including land grabs by Indian companies in Africa, violations of technical and statutory norms in respect of mining, deforestation and nuclear energy projects, on the deployment of 'black laws' like the Armed Forces (Special Powers) Act against human rights defenders, and state violence against Dalits, Adivasis and minority religious groups. INSAF has been targeted because it is among the most vocal critics of recent changes in the legal and regulatory framework aimed at criminalising those who question the authority of the state or challenge its policies. INSAF has consistently highlighted and opposed violations of human rights irrespective of whether they are perpetrated by State agencies, corporations or political parties. 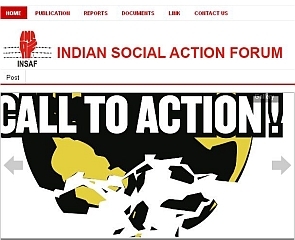 INSAF has petitioned the Supreme Court to against the new FCRA rules that give the government unbridled powers to snuff out the activities of organisations working for public causes by branding them 'political' and blocking their access to funds. Ironically, the action was taken using Section 13 of FCRA against the only organisation which has legally challenged that very section! This is part of a distressing pattern of criminalisation of dissent by the Indian State, evident in its attacks on peaceful protesters, banning of satirical cartoons, and punishing people for their Facebook and Twitter postings. The government has become paranoically intolerant of criticism after the recent anti-corruption mobilisations and protests against sexual assaults on women. The mother of this intolerance is the Union home ministry, run by ultra-conservative bureaucrats who are under the spell of intelligence and security agencies and are naturally inclined to take a hard line on matters ranging from fighting insurgencies, to putting citizens under close surveillance, to outlawing 'suspect' (read, democratic) activities of dissident groups. It may seem paradoxical that the home ministry has tightened restrictions on the freedom of expression and association precisely at a time when the government has liberalised the economy, embraced globalisation and opened up India to foreign investment. India is desperate to attract foreign investment by hook or by crook -- no matter how dubious its source, and whether or not it's a form of money-laundering routed through Mauritius and other tax havens via participatory notes, which feed much of the current $40 billion-plus inflow. If the government is concerned about the possible political abuse of foreign funds, it is hard to explain why it has created one of the world's 'most liberalised investment regimes' for the media, according to the Federation of Indian Chambers of Commerce and Industry. This funnelled some $2.2 billion in foreign funds into that industry in 2010-2011 (and probably much more since then). The media is undoubtedly part of the political process and influences public opinion and party agendas. The 'foreign hand' should be an obvious concern in a sensitive industry like the media, which is distorting our public discourse. But instead of regulating such investment, the government is targeting progressive NGOs and crippling them by abusing FCRA. This violates Article 14 of the Constitution, which is against discrimination and unequal treatment of citizens, and Article 19, which guarantees the right to the freedom of expression and association. The arbitrary and excessive powers FCRA bestows on the State make nonsense of the principles of natural justice and public accountability. Further, foreign investment into industry has been liberalised; 'but the same spirit is not followed while dealing with voluntary sector organisations.' Singling out the voluntary sector for money-laundering seems unfair. Many companies indulge in these malpractices. The voluntary sector route to money-laundering is not at all easy, and there are other simpler ways of doing it. Better monitoring mechanisms are required rather than curbing the financial freedom of the sector. In reality, then, there is no paradox or contradiction between economic liberalisation, and tightened curbs on citizens's freedoms. These go hand in hand with greater freedom for capital. Corporate-led globalisation is predatory on natural resources and people's livelihoods and their fundamental rights. It breeds inequalities and injustices. Popular protests are a natural reaction to these. The State can only curtail them by repressive means. The government has devised elaborate ways of repressing protests, including refusing visas to scientists who warn of potential earthquakes near nuclear sites like Jaitapur, summarily deporting activists sympathetic to anti-displacement movements, and making absurd rules about obtaining prior permission for holding international conferences, which is rarely granted in time. FCRA is only one, if blunt, instrument in its armoury. It must go, with other abuse-prone measures.